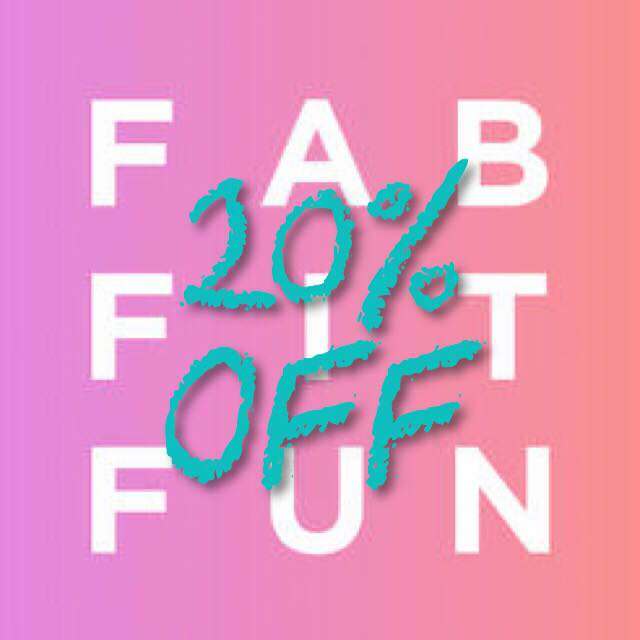 Pin It Happy Friday! Only a short time until Halloween! 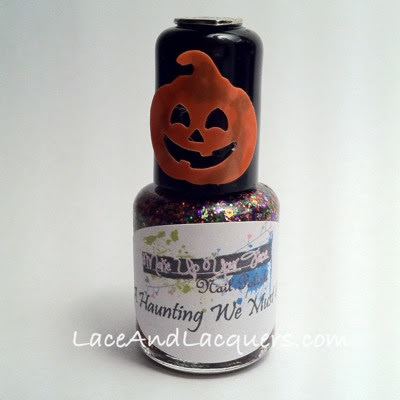 I haven't gotten a chance yet to do some Halloween nail art, I will when I get home next week but, I do have another Halloween Indie for you guys! Good 'ol Makeup Your Face! This one is called A Haunting We Must Go. 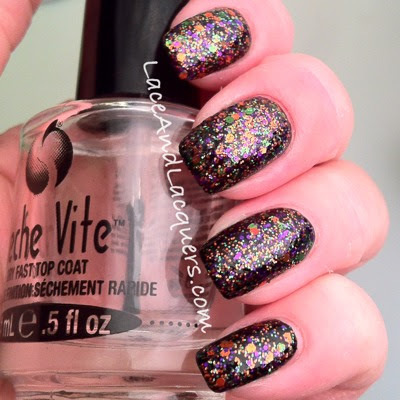 It's a Halloween themed glitter top coat. More pictures after the jump! You may of noticed the little pumpkin on the brush cap. 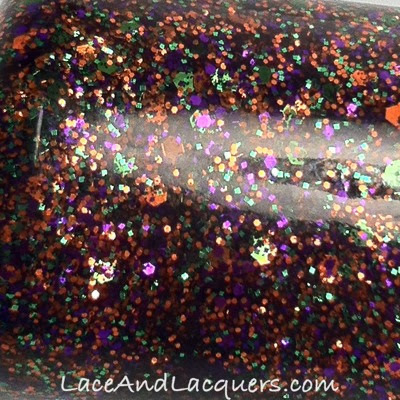 Lauren is adding spooky themed accents for Halloween, ribbons on her breast cancer awareness polishes, and winter themed accents on her upcoming winter collection. And, if you're wondering, they don't get in the way while painting. She did a nice job of gluing them down quite flat. 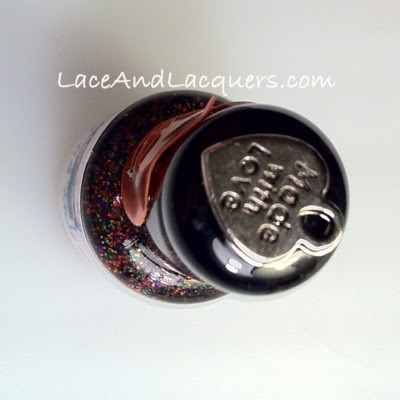 She also let me know that the charm being on the top also allows customers to sit the bottle on the cap, upside down if glitters should settle after sitting around for awhile, without tipping over! What a smart idea! Personally, I prefer them on the cap. Tied on bows never like me and I usually end up taking them off or if I'm being OCD that day, I stick a dab of hot glue on 'em. I did 1 coat of A Haunting We Must Go over a black creme. I was pleasantly surprised how awesome the coverage 1 coat was! Everything was smooth, no clumping and no dipping and dab method needed :] It dried pretty fast and was totally smooth as butter after a coat of Seche Vite. looks really pretty! I love the bottle, too! 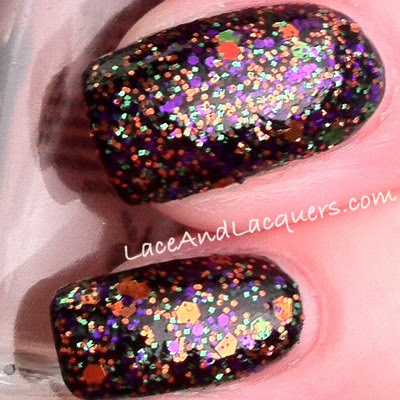 Very pretty Halloween glitter, and I like the charms on the cap too! 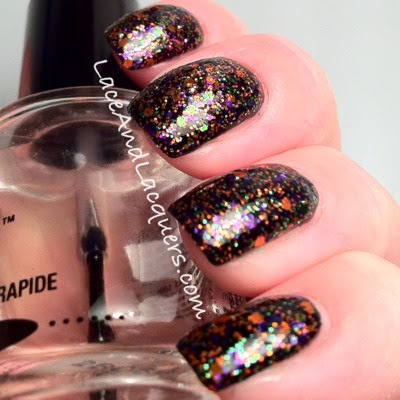 Hot dang, that is some serious Halloweeny glitter there!